PANAMÁ VILLAGE, Honduras — Glenda Chávez walks between the orange trees of her family’s grove, approaching a low wire fence that divides her property from Corporación Dinant’s Paso Aguán plantation. On Dinant’s side of the fence, rows of spiky palm oil trees stretch for miles across the green landscape of northern Honduras. “Here,” she says in a soft, determined voice, pointing to a spot on her side of the fence where a search party found the last traces of her father’s life. ICIJ and The Huffington Post estimate that 3.4 million people have been physically or economically displaced by World Bank-backed projects since 2004. For email updates on our investigation, sign up below. Thanks for signing up for our investigation updates. 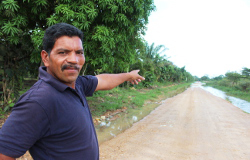 Gregorio Chávez, a preacher and farmer, disappeared in July 2012. Hours later, men from their peasant community found the machete he’d taken with him to tend to his vegetables. The men also found drag marks in the dirt leading toward Dinant’s property, Glenda says. Four days after Gregorio Chávez disappeared, searchers discovered the preacher’s body on the Paso Aguán plantation, buried under a pile of palm fronds. He had been killed by blows to his head, and his body showed signs that he may have been tortured, according to a government special prosecutor investigating his death. Glenda and the other villagers immediately suspected he had been killed for speaking out from the pulpit against Dinant, their adversary in a battle over ownership of land that the company long ago incorporated into its vast palm oil operations. Special prosecutor Javier Guzmán says security guards employed by Dinant are “the leading suspects” in Gregorio Chávez’s killing, but no one has been charged in the case. The company vigorously denies it had anything to do with his death. The preacher’s death was one of 133 killings that have been linked to the land conflicts in Honduras’ Bajo Aguán valley, according to Guzmán, who was appointed by the federal government to investigate the wave of violence that has ripped through the area in recent years. The circumstances of these deaths remain fiercely disputed in a struggle that has pitted Dinant and other large corporate landholders against peasant collectives, with both sides involved in violence that has at times turned gruesome. The conflict has drawn international scrutiny in part because Dinant, one of its central protagonists, has been financed by the World Bank Group. Dinant was backed by the International Finance Corporation, an arm of the World Bank conglomerate that lends to private companies. 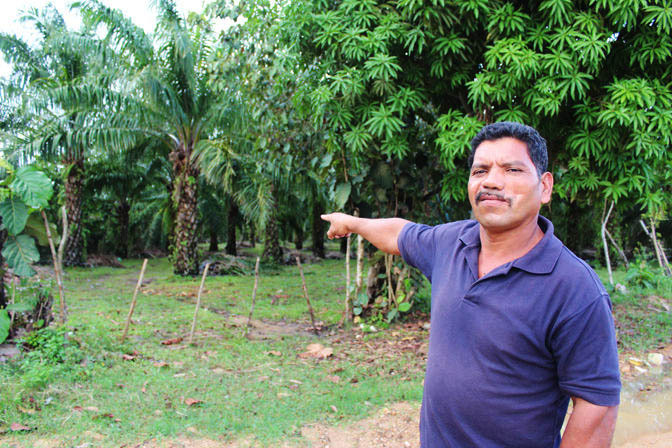 The IFC supported Dinant, one of Central America’s biggest palm oil and food producers, throughout the recent land conflicts. It provided $15 million directly to Dinant in 2009 and later channelled $70 million in 2011 to a Honduran bank that was one of Dinant’s largest financiers. In doing so, the IFC aligned itself with one of the key players in a deadly civil conflict, staking its money and reputation on a powerful corporation with a questionable history. The IFC ignored easily obtainable evidence that should have warned it away from doing business with Dinant, the lender’s internal ombudsman later found. Mark Constantine, an IFC official who conducts social and environmental risk management, said the IFC approved its loan to Dinant before the violence in Bajo Aguán spiraled out of control. He said the IFC is reforming its policies to better anticipate risks to local communities. From 2004 to 2013, the IFC approved 188 projects that may have involved physical or economic displacement of local populations, according to an ICIJ and HuffPost analysis of publicly available project documentation. Because the IFC fails to fully and clearly disclose information about cases involving displacement, it is not possible to conclusively say in every instance whether displacement actually happened. Projects may be removed — or added — as new information arises. Source: the International Finance Corp. Methodology: The cases in this database are based on an ICIJ/HuffPost analysis of publicly available IFC documents, in which the IFC appears to have determined that physical or economic displacement was a possible outcome of a project. 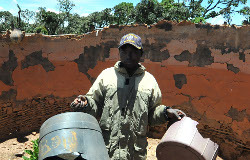 In such cases, displaced families could lose their homes or other assets or suffer damage to their livelihoods. The data was last updated with information available on Dec. 31, 2014. ICIJ also included projects reviewed by the IFC’s accountability body where a complaint regarding land acquisition and/or involuntary displacement was filed. The IFC provided the reporting partners a list of projects to remove because no displacement occurred, investment didn’t end up happening or where it classified the affected people as “willing sellers” of their property. ICIJ/HuffPost excluded them from the database. The IFC did not respond to the team’s final inquiries on methodology and the total estimated tally of projects. Certain projects are connected to more than one country and are counted in each location. View the raw data here. With the growing push for private investment in developing countries, the IFC has expanded rapidly. Its annual lending commitments hit $17.3 billion in 2014, a 36 percent increase since 2010. But despite its growth — and complaints in Honduras and elsewhere that it has funneled money to companies involved in land grabs and human rights abuses — the IFC has remained less known than its sister institution, the World Bank, which lends to governments. The IFC provides less information than its sister organization — the World Bank — about the people who are physically or economically displaced by projects it finances. The IFC does not consistently track displacement in the same type of document, many documents are kept private, and others are incomplete. Both organizations fail to uniformly report key details about displacement projects in six areas identified by a ICIJ review of the IFC and World Bank’s standards and documents. Human rights groups and former bank officials say the IFC takes greater risks and is less accountable than its higher profile counterpart. Complaints about the IFC’s clients often involve vulnerable populations that claim they are being pushed aside to make way for big projects. Since 2004, the IFC has approved more than 180 projects that may involve physical or economic displacement, according to an analysis of IFC documents by the International Consortium of Investigative Journalists. In such cases, displaced families could lose their homes or other assets or suffer damage to their livelihoods. Many of the IFC’s controversial investments involve loans to middlemen, such as banks, hedge funds and private equity firms. By routing financing through these middlemen — instead of lending directly to private-sector clients — the IFC has made it much easier for the ultimate recipients of its money to ignore its standards. 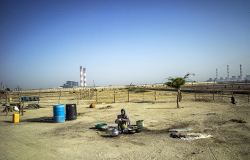 These exposures, the ombudsman said, are “effectively secret,” leaving them “divorced from systems which are designed to ensure that IFC and its clients are accountable.” Since 2012, only 6 percent of financial intermediary loans that the IFC classified as high-risk disclosed the final recipients of the money, according to an analysis by the anti-poverty group Oxfam. Since 2011, six communities in Asia, Africa and Latin America have complained to the IFC’s ombudsman about projects supported by financial institutions backed by the IFC. Those affected include villagers in Uganda who claim their homes were burned to make way for pine and eucalyptus plantations and farmers in Cambodia whose rice fields were taken over by a rubber plantation. The Dinant case is exceptional because it involves a decades-long battle over land that has moved back and forth between big landowners and impoverished farmers — and because of the body count associated with the conflict. The IFC says that it has taken steps to defuse the violence in Bajo Aguán, including hiring a mediator to encourage negotiations between Dinant, peasant groups and Honduran authorities, and persuading Dinant to revamp its security protocols and disarm its guards at several plantations. The IFC has so far withheld a second $15 million installment of its loan to Dinant due to its concerns about the company. The IFC acknowledges that lending money in volatile regions poses risks, but says its work in these troubled areas is critical to its mission. These investments, officials say, provide jobs and prosperity that can help break the cycle of violence. In 2014, the IFC invested $640 million in “fragile and conflict-affected situations.” The IFC has committed to ramping up its investments in these regions by 50 percent between 2012 to 2016. 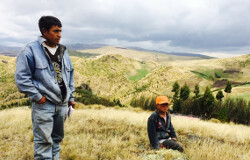 The roots of the land dispute in Bajo Aguán date back to the 1970s, when a national land reform law turned most of the valley’s rich terrain over to collective organizations run by peasants. It was a victory for poverty-stricken farmers, and attracted waves of migrants to the fertile Aguán region. But the peasants’ fortunes took another turn in the 1990s, when Honduras’ government, acting on the advice of the World Bank, dramatically changed the country’s land ownership rules. In March 1992, Honduras passed a law that, for the first time, allowed land belonging to peasant collectives to be broken up and privately sold. The World Bank supported the change, which was part of a series of reforms it promoted as part of its efforts to push Honduras toward a market economy. The World Bank Group is the globe’s most prestigious development lender, bankrolling hundreds of government projects each year in pursuit of its high-minded mission: to combat the scourge of poverty by backing new transit systems, power plants, dams and other projects it believes will help boost the fortunes of poor people. After the new law took effect, expanses of collective-owned land quickly passed into the hands of Dinant and other large corporations. 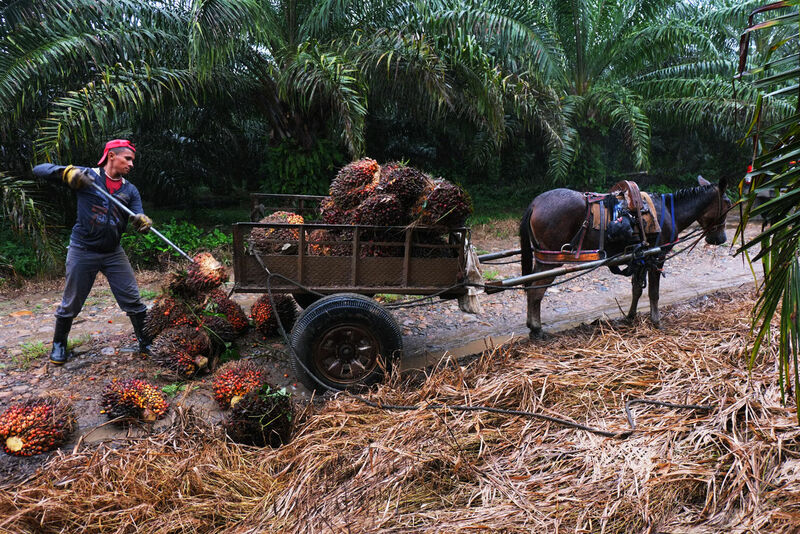 Much of the land was converted to industrial-scale production of palm oil, which is used as an ingredient in shampoo, ice cream, margarine and a myriad of other cosmetics and foods. Environmental groups charge that rapidly increasing cultivation of palm oil has led to deforestation and pushed vulnerable populations off their native lands. Between 1990 and 1994, nearly 21,000 hectares — 74 percent of land held by peasant collectives in Bajo Aguán — was sold, according to a 2010 report by a coalition of peasant organizations. The peasants and their advocates tell a different story. Once the collective land could be sold, they say, peasants came under pressure from large landholders to sign away their rights. Peasants charge that hired thugs harassed leaders of collectives that refused to sell, in some cases riddling their homes with gunfire. Fraud was also rampant, the peasants charge. Small factions within some of the collectives, they say, signed away large tracts in exchange for individual payoffs. In response, peasants formed popular organizations to challenge the land sales in the courts and with the government. They demanded that the government return the lands formerly owned by the collectives to the peasants. In August 2008, 12 people died in a clash between landowners and peasants over disputed land previously used as a military training center. That same month, a team from the IFC visited Dinant to evaluate a prospective loan. Soon after, in December 2008, the IFC’s board approved a $30 million loan to Dinant. 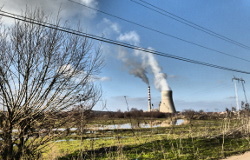 It classified the loan as “Category B,” indicating a low risk that the investment would lead to serious environmental or social problems. The IFC’s ombudsman later found the evaluation team failed to do basic research about Dinant, the largest landholder in the Bajo Aguán region, or its owner, Miguel Facussé, who is ranked by Forbes as one of Central America’s most powerful millionaires. Had the team done a simple Internet search, the ombudsman reported, it would have found news stories showing that Facussé had been accused of being involved in the murder of an environmental activist, had faced a warrant for arrest for alleged environmental crimes and had been embroiled in a series of land disputes. The warrant for Facussé’s arrest, which charged him with allowing one of his food processing plants to dump toxins into drinking water for two decades, was revoked after the judge who issued the warrant left her position. In 2003, a court dismissed accusations that Facussé collaborated in the murder of environmentalist Carlos Escaleras. Facusse and Dinant denied wrongdoing in these legal cases. The IFC and Dinant signed the loan agreement in April 2009, at a time when peasants still hoped that land disputes in the region could be solved peacefully. Honduras’ leftist president at the time, Manuel Zelaya, offered to negotiate with peasant movements and landowners in Bajo Aguán about a political settlement to the conflict that would restore some of the disputed land to peasant ownership. Then a political upheaval sent the country careening into violence. In the summer of 2009, Glenda Chávez had a 7-year-old daughter and was pregnant with her second child. She spent most of her time at home and worked on her sewing machine to earn money. In late June, soldiers stormed the presidential residence, ousting Zelaya from power and putting him on a plane to Costa Rica. Glenda remembers her father described the coup as “barbaric.” But she didn’t get involved in the escalating struggle that was tearing Honduras apart. “I didn’t care very much about politics,” she recalls. The military-backed government that took power made it clear it was not going to proceed with the land reforms promised by Zelaya. Outraged by the coup and out of political options, the peasant movement adopted a new tactic — mass occupations of disputed plantations. The peasants call these actions “recoveries.” Dinant describes them as “invasions.” Many of the deaths in Bajo Aguán have happened during these takeovers. Dinant often called on the Honduran military to evict peasants from disputed areas. Dinant and the military say that the occupiers are always armed and violent. Guzmán, the special prosecutor, said that in some cases peasants killed each other, hiring hitmen to settle struggles within the peasant movement over control of lucrative oil palm fields. Peasant groups say the company and the government have trumped up these allegations to justify abuses by soldiers and company security guards. A 2013 report by the Permanent Human Rights Observer for Aguán, a human rights group affiliated with the peasant movements, found that out of more than 100 violent deaths associated with the land conflict, 89 were peasants and 19 were security guards, police, military or landowners. Vitalino Alvarez, a spokesman for the peasant movements, says the occupations are nonviolent. “Why are the ones who get hurt always peasants?” he asks. In November 2010, five peasants died during an attempted occupation of Dinant’s El Tumbador plantation. While there is little dispute that the company’s security guards fired the fatal shots, Dinant said that they acted in self-defense during an armed attack by more than 160 peasants. Francisco Ramirez, a peasant who survived the El Tumbador occupation, has a thick scar running across his face from where a bullet plunged through one cheek and out the other. He claims he was unarmed and walking toward the front gate of the plantation with another peasant when Dinant guards hiding behind a hilltop ambushed them with a hail of bullets. Roger Pineda, Dinant’s corporate relations director, says no such ambush occurred. Disturbed by the deaths at El Tumbador, the IFC’s president urged Dinant to show restraint and asked Honduras’ government to find a peaceful solution to the land conflict. But the violence continued, moving steadily closer to Paso Aguán and the Chávez family. 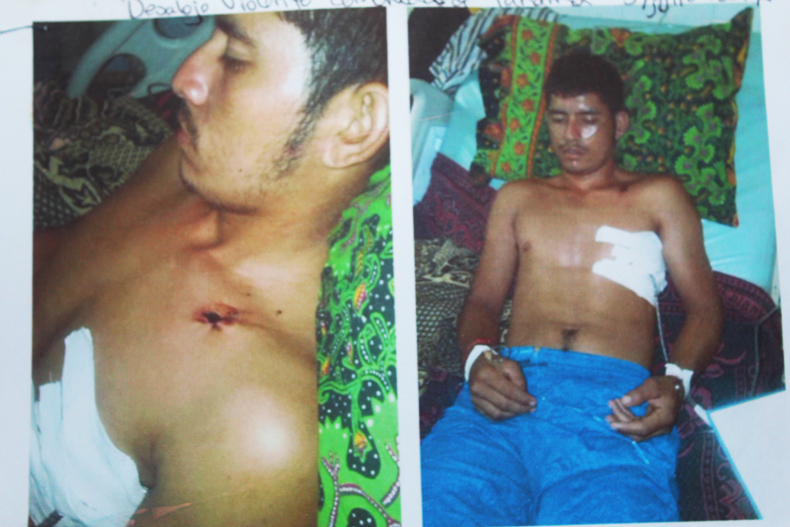 In May 2011, a peasant activist named Francisco Pascual Lopez disappeared near Paso Aguán plantation. Community members found a trail of blood leading into the plantation, according to Human Rights Watch. That same month, the IFC board approved a $70 million loan to Banco Ficohsa, one of Honduras’ biggest banks, intended “to support lending to the country’s small and medium enterprises.” The Dinant conglomerate was among Ficohsa’s largest clients, securing nearly $17 million in loans from the bank in 2008. Three months after the Ficohsa loan was approved, Dinant reported a deadly attack by peasants during an attempted takeover of the Paso Aguán plantation. Four security guards and a Dinant employee were killed, Dinant’s Pineda says, and at least one of the guards appeared to have been executed. The Dinant employee had been tortured and his ears had been sliced off, Pineda says. As the conflict spread, Glenda Chávez recalls, her father began to speak out against Dinant. Gregorio Chávez never affiliated himself with the peasant movements, but he grew frustrated with the company as its security guards became an intimidating presence, imposing a 6 p.m. curfew. 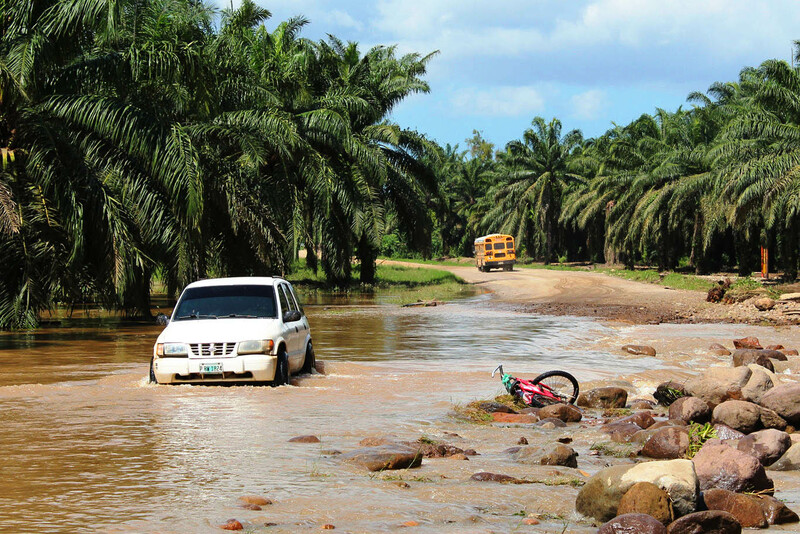 He planted palm oil trees on the family’s property, yet when he went to sell their fruits, his daughter says, he was harassed by Dinant guards and police who assumed his produce was stolen. 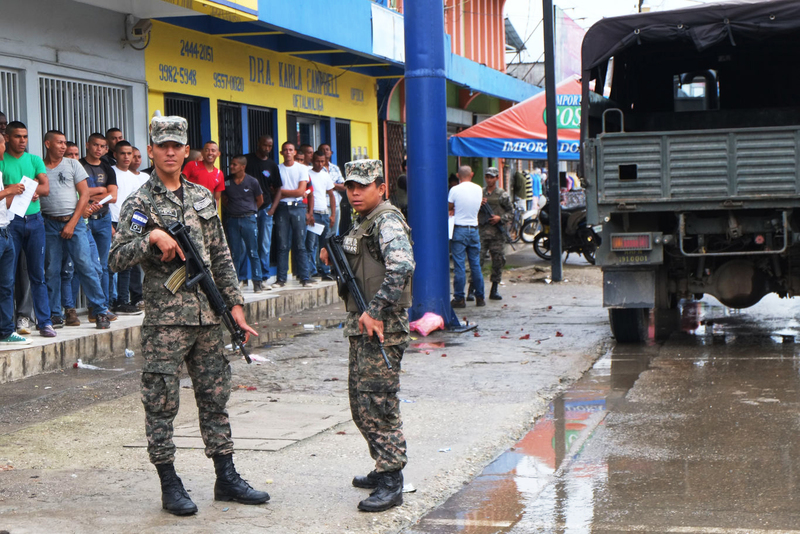 The violence that afflicted other parts of northern Honduras had not yet reached their small community of some 450 families, which was called Panamá. In the final months of his life, Glenda recalls, her father delivered warnings from the pulpit that foreshadowed his own violent death. “He would preach, ‘When they spill the blood of one of us in this community, the community will rise up,’” Glenda says. On the evening of July 2, 2012, Glenda remembers, her mother came to tell her that her father had not come home. “That was when I felt in my heart that something had happened,” Glenda says. The Chávez family and their neighbors launched a desperate search. Glenda called relatives and members of Gregorio’s church and alerted the police and fire departments. After searchers discovered Gregorio’s machete, the community demanded access to the Paso Aguán plantation. Days passed before the searchers gained entry to Paso Aguán. Teams of police and peasants began scouring its 1,200 hectares for signs of the vanished preacher. At first, they came up empty-handed. Then, Glenda says, the peasants demanded access to an unexplored section of the plantation known as Lot 8. Dinant’s guards said the area was restricted and tried to deny them entry, Glenda says. After negotiations with police, the guards agreed to vacate Lot 8, and the peasants and policemen began to search. On July 6, they found Gregorio’s body. Pineda, the Dinant spokesman, says the company no longer had control of Lot 8 when the preacher’s body was discovered. In the days after Gregorio disappeared, Pineda says, the peasants searching for him took over Lot 8 and other sections of the plantation, stealing tractors and palm oil fruits and burning a storage facility. These violent partisans could have brought the body from anywhere, he says. 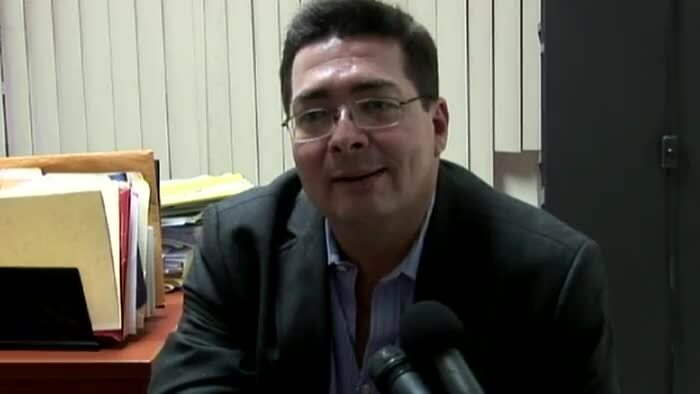 Guzmán, the special prosecutor, says the peasants’ suspicions that Dinant’s guards killed Gregorio Chávez represent the “most credible” explanation for his death. But he says there are no eyewitnesses or scientific proof linking the guards to his death. “They are the suspects, but there is not concrete evidence,” Guzmán says. After the preacher’s body was discovered, outrage swept over the community of Panamá. Villagers created a new organization to fight for their cause: the Gregorio Chávez Movement for Refoundation. Glenda was often called on to speak for the community. It is still painful for her to discuss her father’s killing, but she recounts the events surrounding his death with a practiced calm. 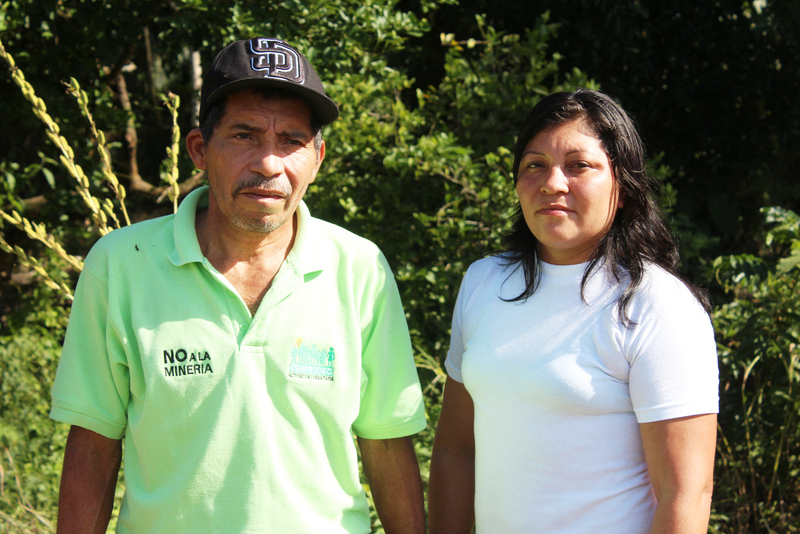 Along with denouncing violence against peasants, the Gregorio Chávez Movement is demanding that Dinant turn over the Paso Aguán plantation to peasant ownership. Dinant has refused to sell any of the disputed land, leaving the two sides in a standoff. Torres later told ICIJ that he was referring to the blood spilled by peasants willing to sacrifice their lives to reclaim their land. “If we have to die here, this is where we’ll die,” Torres says. As the violence in Bajo Aguán spiraled, Dinant continued to benefit from the IFC’s investments. In February 2013, more than a year into the IFC’s investment in Banco Ficohsa, the bank provided Dinant with a new $5 million loan. The money was a part of more than $39 million in loans to the Dinant conglomerate that Ficohsa would approve during the course of the IFC’s investment in the bank. Meanwhile, Ficohsa’s approach to social and environmental hazards was setting off alarms within the IFC. The same month Ficohsa sent the new loan to Dinant, the IFC found that Ficohsa had failed to follow the IFC’s social and environmental safeguard policies, which are designed to protect people in the path of development. That didn’t stop the IFC from continuing to work with the Honduran bank. In November 2013, the IFC’s Global Trade Finance Program provided a guarantee to Ficohsa for two trade finance deals with Dinant. The following month, the IFC ombudsman released its report on the Dinant investment. The internal watchdog found that the IFC had failed at every step to properly investigate or supervise Dinant. The investment department, according to a bank staffer who spoke to the ombudsman, wanted to “get money out of the door” with little regard for social risks, and often overrode the concerns of the safeguards staff. In the Dinant case, the report said, the IFC’s portfolio manager rejected the lead environmental specialist’s calls for a tougher line with the company, and the specialist was then replaced. In June 2014, the IFC purchased a $5.5 million ownership stake in Ficohsa. The IFC has promised to reform its approach to assessing the social risks of projects and to the way it oversees investments in middlemen. It has created a new vice-presidency to handle risk management, and an action plan to improve its supervision of financial intermediary clients and begin screening some of the ultimate recipients of these loans. “We’re trying to address that structurally and also culturally,” said Morgan Landy, director of the IFC’s Environmental, Social and Governance Department, at a forum with community groups in October 2014. On July 3, 2014, peasants from the Gregorio Chávez Movement tried once again to take control of the Paso Aguán plantation. They occupied the plantation for about a day before Col. Jovel’s soldiers moved in and evicted them. Members of the Panamá community say the soldiers opened fire on them during the evictions. David Ponce, a young farmer, shows the scars where a bullet ripped into his shoulder. Others say soldiers beat and tortured them. Glenda Chávez says she was present during the evictions as a human rights observer, using a camera to capture footage of soldiers firing on the peasants. She says soldiers detained her and refused let her go until she surrendered her camera. 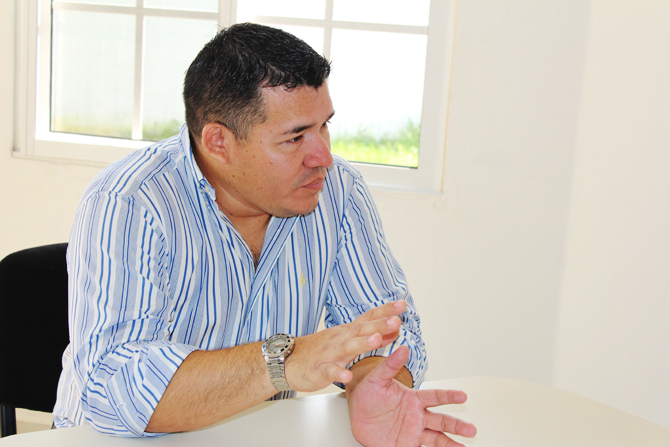 In November, during ICIJ’s visit to Bajo Aguán, Col. Jovel warned ICIJ reporters that the peasants in the Panamá community would try to draw international attention by provoking violence during the reporters’ visit. 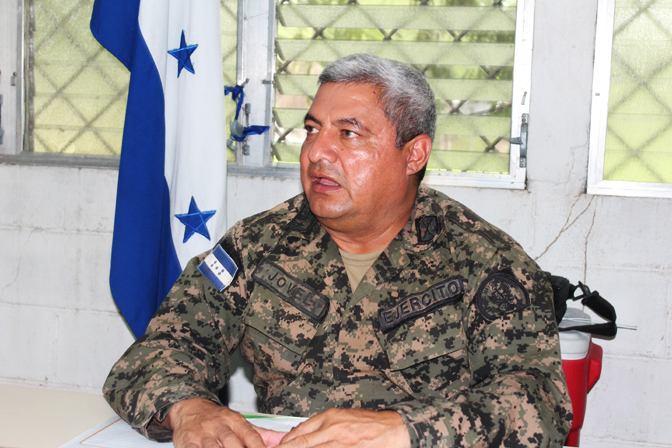 Jovel told ICIJ’s reporters that he had sent soldiers to Paso Aguán to pre-empt an attempted occupation, and that he could not guarantee their safety if they visited the Panamá community. 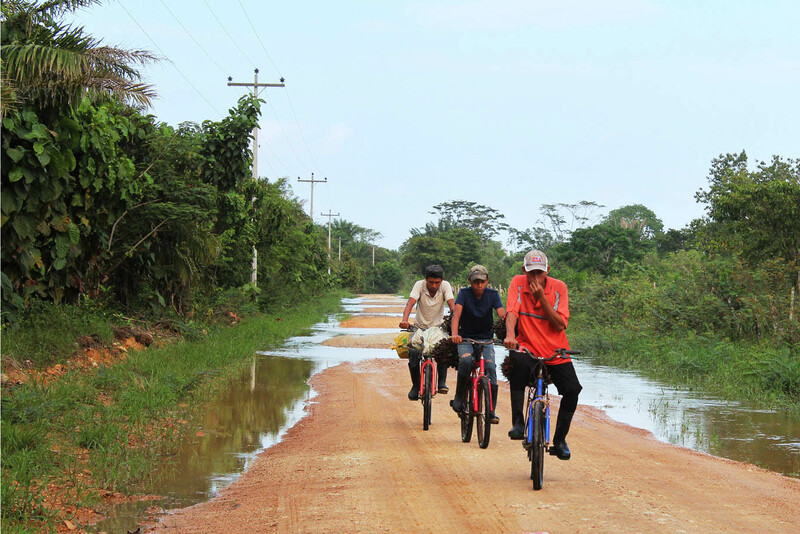 Later that day, ICIJ visited the village, avoiding the disputed lands on Paso Aguán. The grove where Gregorio Chávez disappeared is a short walk along a dirt road from where the peasants had gathered. Glenda has begun planting orange trees between the spiny oil palms planted by her father, which she now believes have only brought suffering to her community. She picks an orange and expertly peels it with her machete. It is ripe and sweet. June 26, 2015: After this story was published, a spokesperson for Corporación Dinant submitted a letter to the editor elaborating on the company's response. The letter can be read in full here. Sasha Chavkin is a reporter at the International Consortium of Investigative Journalists. He traveled to Honduras for this story. Cécile Schilis-Gallego is a data journalist at ICIJ. Produced by Hilary Fung and Shane Shifflett. Video editing and production by Hilke Schellmann.